Why HIIT Is Still a Top Fitness Trend #Infographic ~ Visualistan '+g+"
Every year, new fitness trends come and go. One style of working out has gained and maintained speed for the last three years. We’re talking about high intensity interval training (HIIT). This year, the Worldwide Survey of Fitness Trends named HIIT as the number one trend for 2018. 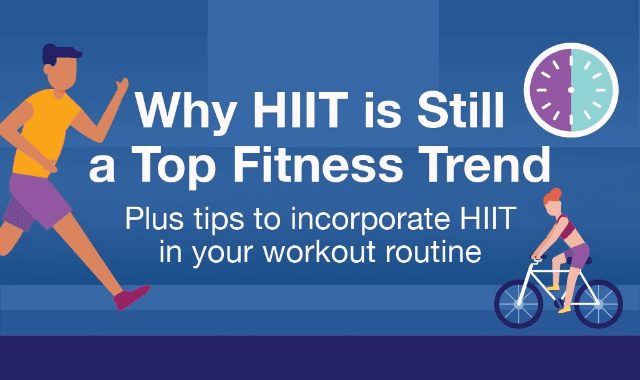 Since 2014, HIIT has consistently rained in the top three slots of the survey. So what is HIIT? A HIIT workout typically alternates short intervals of high-intensity exercise and low- intensity or no exercise (aka rest). Whether you alternate sprints and walking, super fast jump roping with slow jump roping, or jump-squats and marching in place, the goal is to bump up your heart rate and then recover just enough to bump it right back up again. Rather than spend an hour a day walking, jogging, or running, the major appeal of HIIT is that you can get more done in less time. Interested in adding HIIT to your routine? Read on for our tips to stay safe, see results, and have fun.